Tarps Plus Blog: Gym Floor Covers Now On Sale! Gym floor covers are perfect for all schools, keeps gym floors looking like new, It is perfect for seasons when children spend a lot of time in the gym and keeping out of the rain. 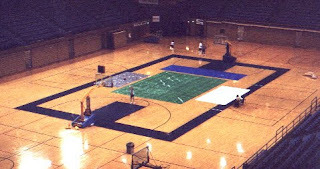 Gym floor covers must be secured to protect from tripping, tarp tape is a great way to secure the gym tarps to the floor and keep them nice and sturdy. Gym floor covers are important to have to protect the investment and can be used in all types of floors including driveways to protect from oil leaks and other damaging materials. Gym Floor covers are a must have for protection. Tarps Plus does have many sizes available and the quality of these Gym Floor Covers are heavy duty and ready to last years to come. Check out the site www.Tarpsplus.com for sales and discounts on all gym floor covers. I purchased 6 of these covers for Dyer St Elementary and the Gym Floor looks newer then it is. Great purchase. These Gym Floor Covers work real well.